Air Massage Jetting can be added to the entire range of Tub Studio clawfoot, skirted and pedestal bathtubs. Clawfoot tubs use 'REMOTE BLOWER' systems where the blower is positioned away from the tub in a separate cupboard, room, or attic. Pedestal and skirted tubs incorporate an 'INTEGRATED BOWER' where the blower is hidden in the pedestal or in the skirt of the tub and there is a Hartford Loop hidden at the back of the pedestal tub or inside the skirt. INTEGRATED Air BLOWER - Available on Skirted and Pedestal tubs. Simple to install - just plug into electrical outlet on wall. Typical Hartford Loop anti-backflow device placed on unseen side on pedestal tubs. Hidden on skirted tubs. REMOTE Air BLOWER - Available on Clawfoot tubs. A little more difficult to install - blower needs placed away from tub. Your Air Massage Jetted tub is equipped with a cUL approved (USA and Canada) 300 watt heated remote air blower that requires a 15 amp 120v GFCI. All of the jets are positioned on the floor of the tub and are specially designed and shaped to be gentle on feet and legs, similar to the feel of our slip resistant surface floor. You won't feel them at all when sitting on them. All of the jets are high quality stainless steel. The blower is three speed and has a self drying purge cycle. The purge cycle automatically commences 30 minutes after the blower has been deactivated. The blower also has an automatic 30 minute time turn off after which it will need to be manually restarted. Activation of the pump is through the air switch located on the wall of the tub. Press once for full flow and press twice for soft flow. When pressed for a third time, this will produce an occasional bubble, but not a steady stream. Pressing for the fourth time will deactivate the blower. It is important that you purge the air lines after bathing or showering. If you use the air jetting during you bath, it will automatically purge, but if you did not use it, you will need to turn it on and turn it off and it will automatically purge itself after 30 minutes. Without purging, soaps, water etc. can sit in the lines leading to blockage. Where is the blower fitted? We supply 12' of flexible air hose to connect your tub to the blower housing. The blower would generally be situated in an adjacent room cupboard or linen closet inside the bathroom. Another option is to build a small housing unit that can be placed along the end or side of your tub. The smallest housing for the entire blower and Hartford Loop would be 30" x 10." We recommend using a 10" x 10" air vent at the blower to allow for air flow and access. The height of your housing will depend on your tub height. The minimum height will be the same as the faucet deck height on your tub (see photo for example). How is the blower operated? 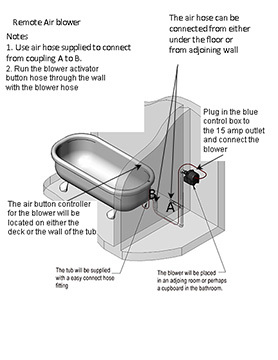 On the wall of your tub we install an air operated button that is fed back to the blower (see photo) for activation. This eliminates the need for a remote controller that may be misplaced. There is no electricity at all running to your tub. The jets are all on the floor of the tub. How do I connect the jets to the blower? After you have decided on the housing area for the blower, you simply connect the air hose to the coupling on the tub and to the coupling at your housing. On slipper tubs, when you place your order, please specify which side of your tub will be against the wall so that we may position the 'Quick Connect Coupling' on that side to hide it from view. This does not apply to double ended tubs as the coupling will always be in the center of the tub at the drain. Will the jets' air lines fill with water? We include a non-return valve at the 'Quick Connect Coupling' and a Hartford Loop to prevent back flow. Any water that enters the air tubing will be completely blown out and the air lines dried when the automatic purge cycle on the blower activates 30 minutes after deactivating the blower. How do I access the blower if I use and independent housing unit for the blower? With an independent housing, we recommend that you incorporate an air vent at the blower. If you use a 10" x 10" vent, this can also be used as the inspection panel for the blower. If you build the blower into a cupboard, you must also ensure that air flow is plentiful. Will the jets ever become clogged? The opening in the jets itself is about 1/8". In the unlikely event that a jet does become clogged, it can be cleared easily by inserting a thin object to loosen and activating the blower to blow out. Can I use bubble bath or aromatherapy oils? Yes, but remember the agitation of the jets might cause the bubble bath to become very bubbly, causing them to spill out of the bath. What specifications does the tub meet? The tub itself meets or exceeds the requirements of ANSI Z124.1.1-2005. The tub is cUL listed for both the USA and Canada and the back flow prevention of the Hartford Loop with the approved non-return valve (also supplied) meets or exceeds the requirements of ASME A112.19.7-2006. What electrical connection will I need? The blower requires a dedicated 15 amp - 120 volt GFCI. How loud is the blower? Most blowers give out about 95 decibels which is quite loud. We exclusively use an Ultra Quiet pump manufactured in the USA that gives out under 65 decibels. When you are sitting in your tub, you hear the bubbles, not the pump. Will I need anything else to install the Air Massage Jetting system? The only items you will need will be a screwdriver to connect the air hose to the couplings. You will also need to install the dedicated 15 amp - 120v GFCI.